Mind goes blank. Our motor organs refuse to work in the wake of an accident. As we never care to read the motor policy we are simply ‘washed away’ in post accident events. We can give no possible reason as to why we acted the way had acted. The ever curious mob invariably gathers at the site of accident. No one bothers to call either the police or the doctor – ‘let us not get involved’ philosophy. It is a situation of ‘together alone’! 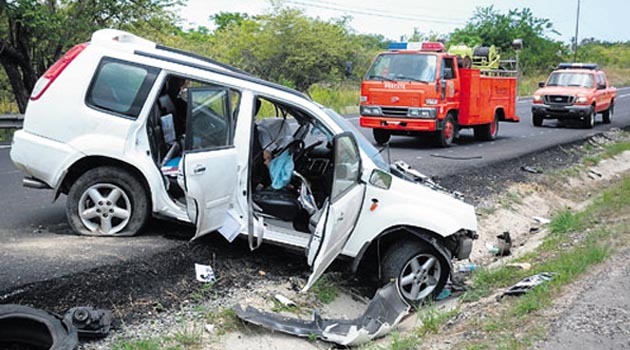 Having lost the precious life saving moments, invaluable eye witnesses and property, the realization dawns – ‘if only I read the motor policy’. It is too late by then…having lost everything; we are transported to the land of no return. IF ONLY I READ THE POLICY….Please read on. Driving on Indian roads is a risky proposition.Â Whenever you are in a vehicle, there is a huge chance of involving in a traffic accident.Â Whether it is a small scratch on the vehicle or a major injury accident, knowing in advance what to do can help avoid costly mistakes. This guide discusses what to do after an accident and what to expect when a claim is lodged with insurance company.Â For convenience, an accident checklist is contained herein which can be kept in vehicle for future reference. When purchasing insurance, carefully review the application before signing it to be certain that the coverage, policy limits, and deductibles suit the needs.Â On receiving the policy, review the policy schedule. It contains important information such as who is covered, the vehicles insured, as well as the coverage limits and deductibles. Make sure the information is correct and the coverage is what is originally purchased. If changes are needed, send the request to agent and/or insurance company in writing and keep a copy.Â Use registered post acknowledgment due to verify receipt of letter. Become familiar with the motor insurance policy before it is needed. Read the policy thoroughly to know what is covered and what is not. Immediately stop at the scene. Call 100 / 101 if there are injuries. Call the police. In some areas police authorities may not come to every accident scene.Â Â They may consider factors such as the severity and location of the accident. However always attempt to notify the police.Â Also be aware that most policies require police notification within a specified time period if the accident is a hit and run.Â Obtain names, addresses, telephone numbers, and driver’s license numbers from all drivers. Obtain license plate(s) and vehicle identification numbers.Â Ask to see driver’s license(s) and vehicle registration(s) to verify that the information is accurate. If a camera is available take photographs of the damage, the position of the cars, and the accident scene (e.g., traffic controls, visual obstacles). Notify the agent and/or insurance company immediately. Do not argue with other drivers and passengers. Save the story for the police and the insurance company. If another party offers to pay deductible, don’t sign anything releasing him or her from further responsibility.Â By releasing the other party, we jeopardize insurance company’s subrogation right, and the company may refuse to pay for damage. The insurance company will contact for additional information, such as a detailed account of the facts, or a written or recorded statement.Â An examination under oath may be requested.Â As part of the investigation, other drivers and witnesses may be contacted. If there are medical payments or an uninsured motorist claim, ensure to provide documentation of injuries, medical expenses, lost wages, etc. A claim representative should contact within a reasonable period, usually 24-72 hours after the loss is reported. If no one has called then call the agent or insurance company for assistance.Â If they are not responsive, or if there is an unreasonable delay in settling claim, contact either the IRDA or concerned insurance ombudsman. An adjuster or surveyor usually inspects the vehicle.Â Do not authorize repairs until the adjuster has inspected the vehicle and satisfied with the scope of repairs and the repair facility.Â If the damage is relatively minor, the company may ask to submit competitive repair estimates. Read policy to be certain of what is and what is not covered.Â Pay special attention to exclusions. For example, there is usually no coverage for stereo equipment, a telephone, or a band radio unless the equipment was permanently installed by the motor manufacturer in the normal opening in the dash or console.Â Coverage is usually available for such special equipment for extra premium. Actual cash value means the fair market value of the car before accident.Â This is the price that a willing buyer would pay a willing seller, neither under pressure to buy or sell. The Insurance Company may survey dealers, value guide books, and private parties for a similar vehicle to approximate the ACV.Â A computerized market analysis system might also be used. If no agreement is reached with the company’s figure for ACV, do an extensive survey of dealers and private party sellers in that area.Â Companies are required to offer a fair settlement.Â If it can be shown that the figure thus supplied more closely approximates the ACV, company should be willing to negotiate. Some policies also contain an appraisal provision. Most standard policies contain an appraisal provision which can be helpful in the event of disagreement with company on the amount of loss. Â Read policy to see if it contains one. Under this provision either of the party can demand an appraisal.Â Each party selects a competent appraiser.Â The appraisers then select an umpire.Â If the appraisers cannot agree on the amount of loss, their differences are submitted to the umpire.Â Â An amount that any two agree upon is binding.Â Each party pays its appraiser; the umpire fee is shared. The cheque may be made payable to the insured and any lien holder, such as a bank or finance company. If the vehicle is repaired, the company may also include the repair facility as a payee. The borrower is responsible for the balance of the loan, even if the vehicle is stolen or damaged beyond repair. If the claim payment is less than the loan balance, the lender will expect you to pay the difference. Coverage commonly referred to as “gap”. Insurance can be purchased to protect against this situation. The policy provides for rental vehicle coverage.Â Review the policy before renting a vehicle. Although policy limits vary, the company pays up to a specified amount per day for a specified number of days. The coverage ends when vehicle is repaired, the loss is paid, or after the specified period, whichever is earlier. If the vehicle is stolen, the policy may automatically provide transportation expenses. Again, review policy to be sure.Â This type of coverage usually begins 48 hours after the theft and ends when your vehicle is recovered, the loss is paid or after a specified period, whichever is earlier. The terms of the rental agreement make the customer responsible for collision damage while he or she has possession of the vehicle.Â Additionally, rental companies insure themselves for damage to the vehicle caused by collision.Â For an additional fee, the rental company will waive all or a portion of the customer’s obligation to pay repair costs for damage to the vehicle caused by collision.Â Both the amount of the fee and the language of the waiver vary. Coverage for collision damage to the rental car under your personal motor policy depends upon the policy language.Â Read policy carefully.Â Ask agent or company before renting a vehicle. This is the remaining value of damaged vehicle if the vehicle is determined to be a total loss.Â It is usually determined through bids from salvage buyers.Â The company may sell the salvage to the highest bidder.Â However, it is not obligated to do so. If the policy holder decides to keep the damaged vehicle, the highest salvage bid may be deducted from settlement.Â Â In effect, we are “buying back” vehicle for the salvage value. Subrogation is the right of the insurance company to recover from a third party the amount of damages it paid. For example, if another party is at fault in an accident that damages your car, and you have a claim, your company will ask the other party to reimburse the money it paid on your claim. The policy requires cooperation with the company’s subrogation efforts.Â Also, remember not to do anything that jeopardizes the company’s right of recovery.Â For example, one cannot sign an agreement releasing the other party in exchange for payment of deductible. The insurance company must advise whether or not they intend to pursue subrogation.Â If the company pursues subrogation, they are required to include deductible as a part of the process.Â However, if the company does not pursue subrogation they are required to advice of that fact. If their efforts are successful, in whole or in part, the company will reimburse in accordance with the recovery.Â For example, if 100 percent of the paid claim is recovered, the policy holder will receive 100 percent of deductible; if the recovery is 65 percent, the policy holder will receive 65 percent of deductible. Any expenses or fees (e.g. legal fees incurred by the company in its recovery efforts) will be apportioned between the company and the policy holder, if recovery is made.Â However, if the policy holder chooses not to have the company include deductible in its efforts he can seek recovery directly from the other party on his own. Notify the agent and insurance company immediately.Â Keep a copy for self and mail or deliver the original documents to the company.Â Do not give statements or discuss the accident with anyone except a verified representative of company.Â If the lawsuit arises out of a covered loss, the company will provide legal defence. 1.Read your policy. Don’t wait until after an accident. 2.If you do not understand the policy, ask the agent and/or company for clarification. 3.If you have an accident, call the police. 4.If there are injuries, call the doctor. 5.Get as much information as possible at the accident scene to furnish to agent and/or insurance company. 6.Immediately notify the agent and/or insurance company of an accident. 7. Cooperate with the insurance adjusters/investigators to aid in their efforts. 8. If something about the claims procedure is unclear (e.g., amount of settlement), ask the agent and/or insurance company representative to explain. 9. Notify the agent or company in writing of any change in vehicle ownership. Advise of all benefits, coverage, time limits, or other provisions of insurance policy. Respond to communications received immediately, but no later than 15 days. Unless the insurer has provided with the name of a specific towing company prior to using a towing facility, the insurer must pay reasonable towing expenses. Offer a fair settlement.Â If suffered a total loss, settlement must include taxes, license and transfer fees.Â The settlement must reflect the value of deductions from the settlement for salvage must be fair, measurable, and discernible. Advise whether or not they will pursue subrogation.Â If the insurance company pursues subrogation, they must include deductible. The above represents a brief overview of some of the points of Fair Claims Settlement. Charging for genuine parts when used parts were used. Pounding out dents when charging for brand new auto parts. It is always important for the consumer to review carefully all paper work from motor body and repair shops in order to protect against potential fraud.Â Also, consumers should be cautious of any motor body or repair facility that makes referrals to medical or legal offices. If there is a motor accident, be cautious of any unsolicited referral to a body shop, law firm or medical office.Â Organized accident rings actively solicit others to participate in the creation of accidents.Â Often these accidents only exist on paper (referred to as paper accidents), and no innocent parties are involved.Â Paper accidents have gained in popularity among fraud perpetrators, as they are less dangerous from a bodily injury standpoint, and there is less or no likelihood of police involvement.